I have done them in excel (or LibreOffice Calc) and take a screenshot of them. Anyone had any luck yet with the new free Musecore 2.1 yet? 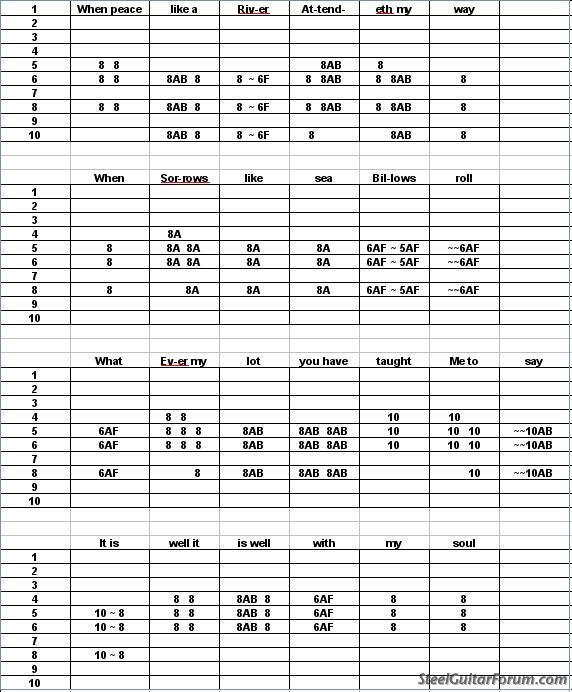 It can do notation and tab together at the same time. How are you guys posting your tab nowadays here on the SGF tab section? Scott, thanks for the effort, but Excel is too challenging for me to read easily. I've used Guitar Pro for years. It is inexpensive and easy to learn. It'll do both tab and notation at the same time. 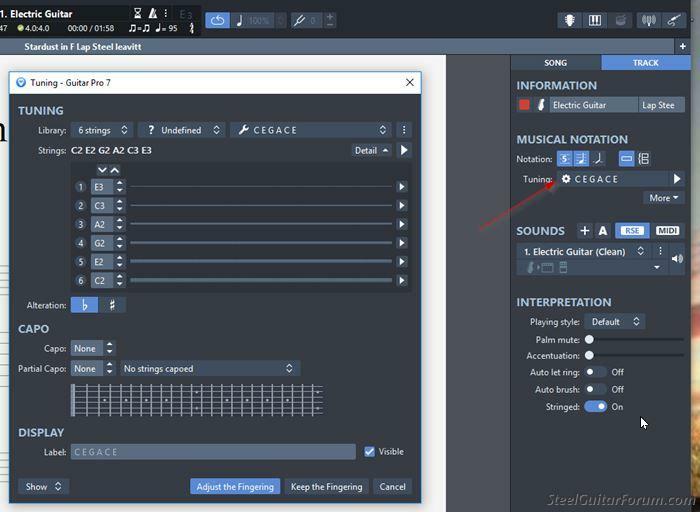 However, if you write in notation, the tab will be musically correct but not in the positions where you'd normally play them so you'll need to edit the tab. I use Guitar Pro and I set it up in the preferences to display tab only. It prints out and looks just like the tab you get from Troy. Then just post that on the site as you normally would. You can do it in Notepad (Windows) or Textedit (Mac) using a monospace font. Then copy/paste into a forum post between the [tab] and [/tab] BBCodes. Here's an example of the plain text method. It's for pedal steel, but the same technique works for lap steel tab and for tuning charts. Bob, the old forum section used to be able to use something called "tab edit" if I remember correctly. It was very basic but easy to use and then you would post it using the [Tab] markers that you explained above. Does that still work, I don't see anyone using it on the new tab section? I've never tried any other method. Sorry I can't be more help. 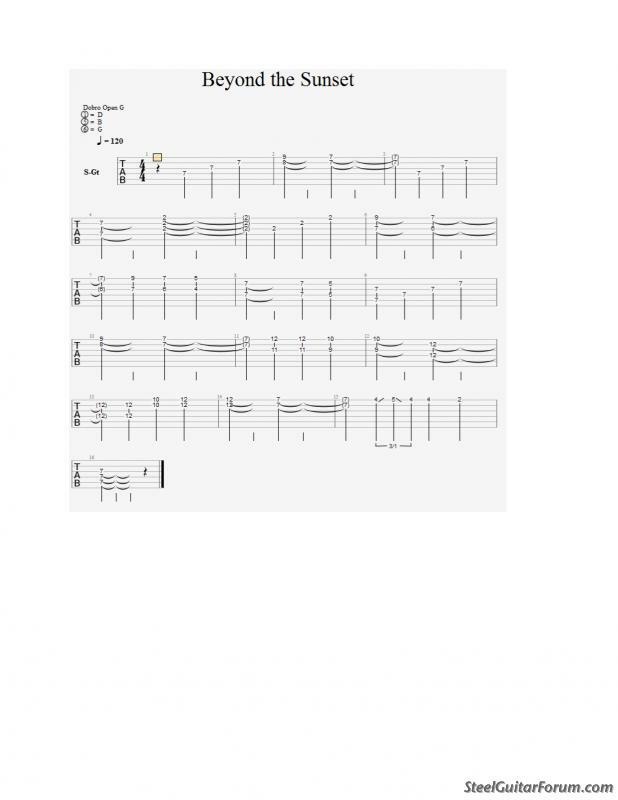 I created this with Guitar Pro ver 6. Then did a screen capture by pressing the Prnt Scn key. Then dragged the mouse around the part to be copied and saved it as a png file using Windows 7. On the forum I uploaded the file. Doug Beaumier's books are all published with it. At least, they were the last time I asked him. 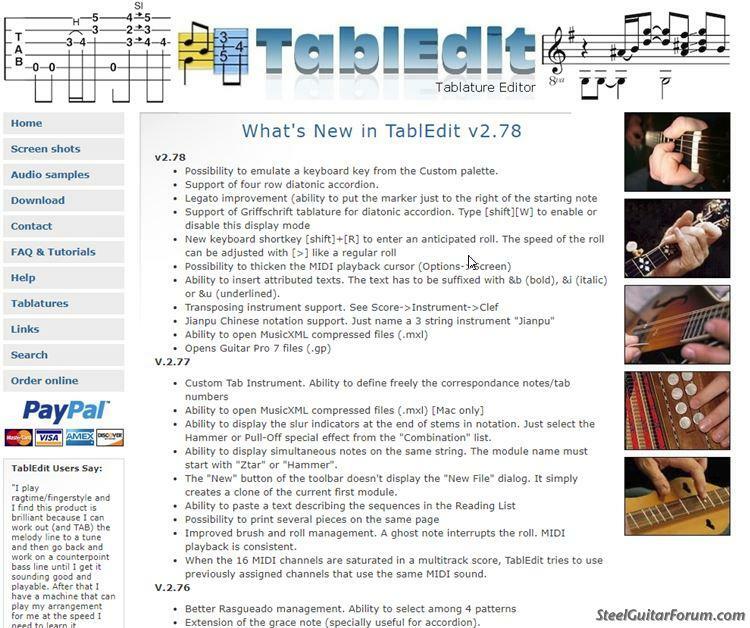 Tabledit does a great job, but it's been surpassed by GuitarPro. The GuitarPro interface is more "mouse friendly" than Tabledit and you could argue that it has more features. But, once you're used to it, you can go very fast with Tabledit. Like JPG, a PNG file is a picture. Use the "Upload picture" button to post it. You don't need to host it elsewhere. Reminds me of Jerry Byrd method. You can't go wrong Erv. You can't beat Jerry Byrd. I see it, Erv, but I have no clue how you made it. Enlighten us, please. 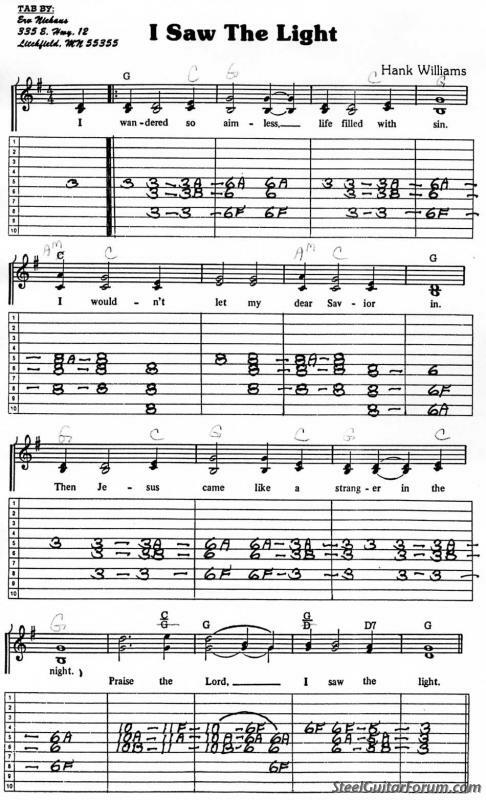 For Guitar Pro users what tuning(s) do you use? When I select a C6 tuning GP gives me CGCGAE reading from low to high notes. What I would like to use is CEGACE. Is there a trick to getting the latter tuning? I use GP version 7.5. I have had success in finding CEGACE in TablEdit. That's always been a little obscure in GuitarPro. Go to the track menu for your instrument. Click on the gear symbol next to "Tuning"
and you'll see the pop up. I use Guitar Pro 7 and for the Forum, output to PNG,then post each page of the tab. I do it all by hand, no program involved. The only thing I use is located between my ears. I just use Excel, one of the most powerful format programs there is. Actually I use the free OpenOffice version of Excel which looks pretty much identical to Excel. It's easier than it sounds and once you've done a few tabs you can use them as source for new tabs, changing only what needs changed in the new tab. The notes on the staff aren't by hand, and neither is the tab grid. That's why I asked. Greg, could you share your OpenOffice template? Cut and tape, cut and tape.